I’m a big talk-radio fan, and I was just listening to the Chewing the Fat food show and its commentary on whole-animal butchery. It’s still a ‘gourmet’ practice in the U.S., say the Chewing the Fat hosts. Some restaurants are doing it, but it hasn’t caught on as a best practice yet. The segment reminded me of an article I wrote a few years ago on the same subject, about a restaurant practicing whole-animal butchery on a regular basis. The Berkshires are typically on the leading edge of sustainable food trends, and it was nice to know I had a little bit of a working knowledge of a culinary tactic that’s just now approaching main stream. Where will sustainable butchery be in a few years? Time and tables will tell. Every other week, Fiori Restaurant’s executive chef Alex Feldman purchases one pig from Leahey Farm of Lee, Mass., a local purveyor just two towns over from the eatery’s home in Great Barrington. It’s a formidable purchase: 200-pounds of pork is no easy feat to transport, let alone prepare. But soon after it reaches Fiori’s kitchen, Feldman sets to work creating a wide array of Northern Italian dishes, using as much of the pig as is possible. This traditional approach to food preparation is being seen more and more in the Berkshires and beyond; not only does it showcase an endless number of flavors, it’s an example of whole-animal butchery, a much more sustainable option than the techniques that have been used in restaurants across the country for decades. From one source, Fiori offers Bolognese sauce for its house-made pastas, handmade sausages, ribs, head cheese, ciccioli – savory, pressed chips made from the belly of the pig – and panino sandwiches, to name a few dishes. 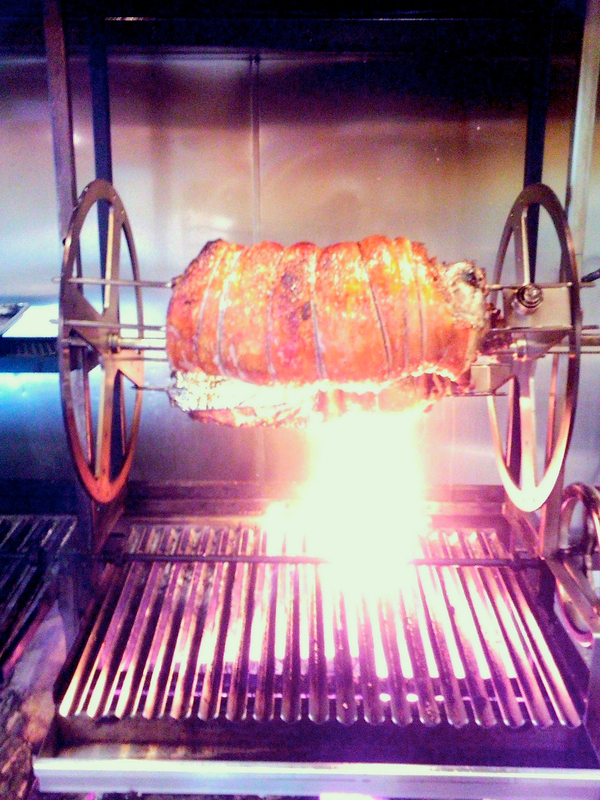 The capstone of Feldman’s whole-animal repertoire, however, is traditional porchetta, a boneless pork roast that is often a sign of celebration across Italy. Slow-roasted on a spit over a wood-fire grill, porchetta includes an herb stuffing layered into the meat, fat, and skin – at Fiori, this blend includes sage, parsley, and rosemary, garlic, fennel, and lemon. It’s served in myriad ways, from small bites to entrees. Feldman has even put his own spin on Eggs Benedict at brunch, adding seasoned porchetta to a slice of fresh ciabatta toast and a poached egg smothered in pickled-chili Hollandaise sauce. He said this wide array of dishes is yet another reason whole-animal butchery is gaining popularity among chefs. Indeed, Porchetta and other pork dishes created in the whole-animal philosophy are just one example of locally sourced ingredients at Fiori. Greens are purchased from Equinox Farm in Sheffield, Mass., chickens and eggs from North Plain Farm, a free-roam farm in Great Barrington, and rich oyster mushrooms have just recently arrived in the kitchen from Zehr Farms in Ghent, N.Y.
Feldman, who has apprenticed under chefs in Florence, Bologna, and Piedmont, Italy as well as under Chef Mario Batali at New York City’s Babbo restaurant, said Fiori’s goal to remain true to Italian traditions is well aligned with the growing sustainable movement in Berkshire County. Note: Fiori restaurant closed its doors in 2012. Most recently, Chef Alex Feldman could be found at Barcelona Wine Bar in Connecticut.